February 10th, 2015, Charlottetown – Just days ahead of the 2015 Canada Winter Games, P.E.I. 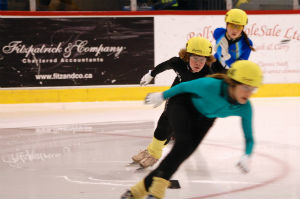 short-track speed skaters took to the ice for a final competitive tune-up in Dieppe, N.B. recently. The Island team, consisting of 30 skaters, including the eight-member Canada Games squad, won ten medals, including five gold. Jenna Larter (left) of North Wiltshire won a silver medal for P.E.I. at a recent short-track speed skating meet in Dieppe, N.B. The medal was one of ten for the Island team at the event. Photo courtesy of Mike Sullivan. Taking gold medals for P.E.I. were Eliana Monthony of Cornwall in division 7, Jacob Manning of the Eastern Kings Speed Skating Club in division 9, and Olivia Wood in division 14. Monthony’s medal was her third of the season and first gold, while Manning’s first place performance marked a strong return to competition after three seasons since his last competitive outing. Wood captured her first medal in her first ever off-Island meet. Also capturing gold medals for P.E.I. were Jenn Nickerson and Rob Binns, both competing in the Masters division. Nickerson, of Charlottetown, was competing off-Island for the first time, while Binns improved on his own provincial record time in the 777m distance on his way to the podium. Silver medal winners for P.E.I. included Kristen Binns (division 6), Jenna Larter (division 9), Daniel MacKinnon (division 9) and Addison Bruce (division 11). Andrew Binns rounded out the Island medal tally with a bronze medal in division 2. Jared Vriends posted the fastest times among Island skaters, taking fifth place in division 1. He was closely followed by Canada Games team-mates Zach Moran, Peter McQuaid, Michael Rogers and Andrew McQuaid, also competing in division 1. Carly Connell, Miriam Burnett and Korrina LeClair, members of the Island’s female Canada Games team, recorded fast times in a strong division 2. Other Islanders competing in Dieppe were Thomas McQuaid, William Lyons, Matthew Kozma, Mia Stewart, Carter Bruce, Matthew McKenna, Liam Chatfield, Alex Rogers, Zachary Chatfield, Anderson Arseneau, Jane Bruce and Holly Nickerson. Paul Tremblay of Saint John and Courtney Sarault of the host Codiac Cyclones club took top honours for male and female skaters at the event, which attracted a large field of 190 skaters from 11 Atlantic clubs. For full meet results and more information on Speed Skate PEI, visit www.speedskatepei.com.